Home » Technology News and Business Updates Of Pakistan » How To Avail Telenor Free Facebook, Twitter, and WhatsApp Offer? How To Avail Telenor Free Facebook, Twitter, and WhatsApp Offer? 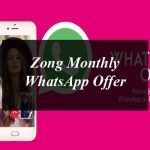 Telenor has launched another outstanding offer and is letting its customers to enjoy Free Facebook, Twitter, and WhatsApp daily. The Telenor Free Facebook, Twitter, and WhatsApp Offer lets the customers to enjoy 100MBs of internet daily absolutely free of cost. All the Telenor and Djuice prepaid customers can avail this Telenor Free Facebook, Twitter, and WhatsApp Offer. Customers need to subscribe the offer again the 100MBs expire after one day.